F.M. 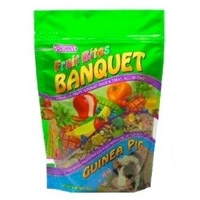 Brown's Fruit Bites Banquet Food Guinea Pig 2 lb. Prepare your guinea pig a gourmet feast with Brown's Fruit Bites Banquet, a fun-filled meal and treat, all-in-one. Our vitamin fortified premium diet is jam-packed with real papaya Fruit Bites and tasty fruit flavors. In addition we've added our sweet and crunchy Veggie Bites to make it extra delicious. F.M. 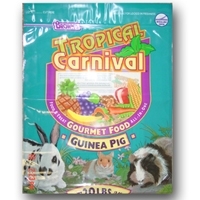 Brown's Tropical Carnival Guinea Pig 20 lb.